Not always the case when baking. There are usually a few steps/preparations, and a bit of a process when baking, and then there is the trial and error of gf/df/sf baking (and egg free when my oldest is joining us) but don’t get me wrong, it is certainly worth all the effort when you take that first (right out of the oven) joyful bite. BUT, when a pie like this is simple and doesn’t require baking, HELLO, let’s get this party started! And party we did, literally, with this beyond-decadent chocolate peanut butter pie to celebrate my oldest son’s 22nd birthday last week. Gosh, I vividly remember when I took him to his first day at pre-school as he proudly said bye-bye in his grown-up cable sweater and corduroy pants eighteen years ago. We went from a homemade Korean-inspired dinner to an all-American classic combination for dessert. Dinner: a bit of a process. Dessert: Easy as pie. Ha! I couldn’t resist saying that. Both were a standout and a must try (will post the bibimbap and kimchi pancakes soon) … I can still taste the flavors … it was an amazing meal that had us digging into our dinner bowls then our pie with gluttonous determination. We managed to take a breath between dinner & dessert. I came across a version of this pie on Pinterest; a recipe originally by Ree Drummond, the Pioneer Woman (click here for the original recipe), as she calls herself, and went for it. My son is a big chocolate and peanut butter fan. He also loves, loves Justin’s dark chocolate peanut butter cups so I just had to throw some in – the element of surprise. As if that wasn’t enough, I added some remaining crushed cookie crumbs on top. Ree’s pie did look amazing, but I couldn’t resist to take it up a few notches for my birthday boy. Oh. My. Peanut Butter. Chocolate. Goodness. 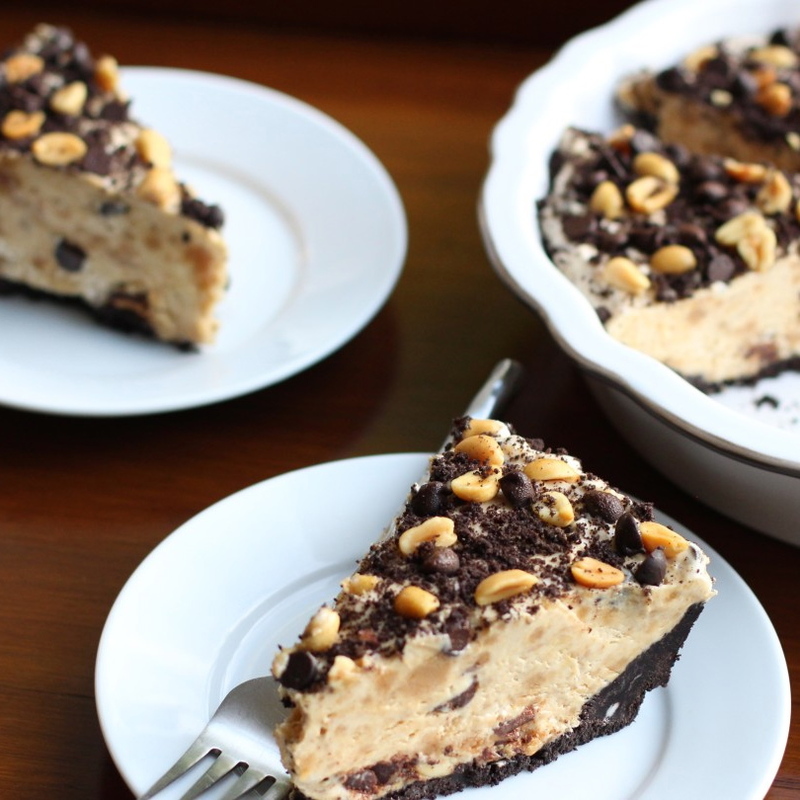 If you have a peanut butter/chocolate fan this dessert will make you look like the ultimate rock star. 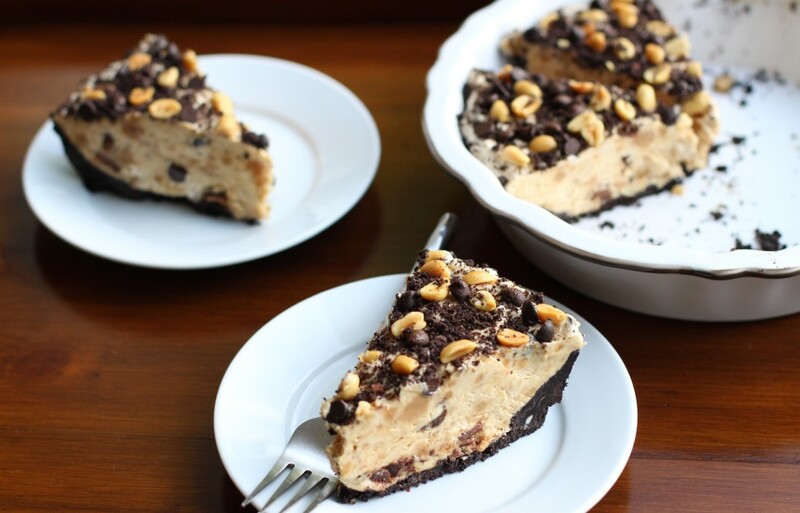 Bits of peanut butter cups, peanuts, creamy filling, cookie crust … okay, enough said. I will hand over the spatula to you to try it for yourself. Well, maybe not all for yourself, you will share won’t you? 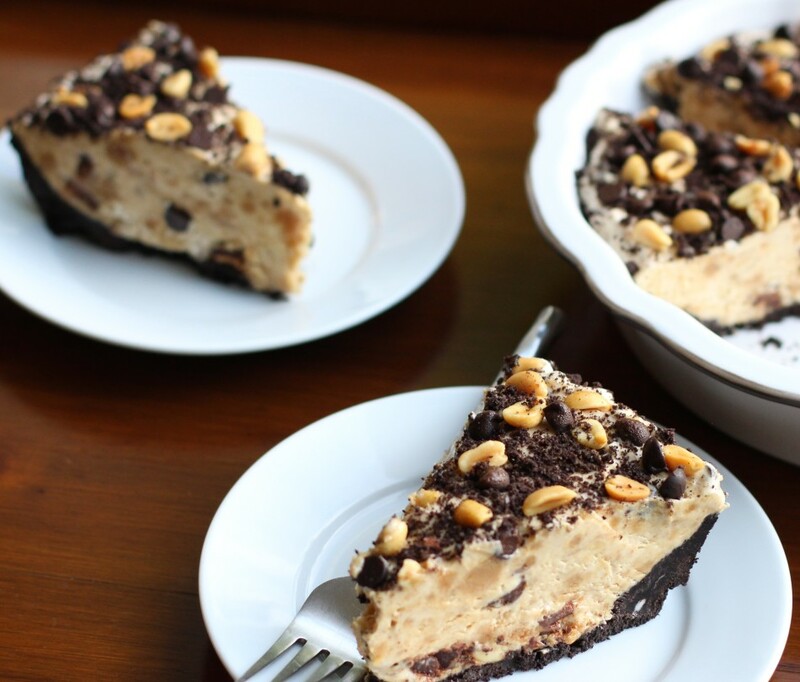 So easy and full of peanut chocolate-y delicious for when you want a simple no-bake dessert to impress! *Prep Time includes chilling time. Crush the cookies in a food processor until fine crumbs.Transfer all but 2 tablespoons of crumbs (reserve for later) to a small bowl then add earth balance 'butter' spread. Combine with a fork, or hands until fully blended and begins to take shape. Chill in the freezer while preparing the filling. In a stand mixer set with a paddle attachment, or using a hand mixer set on medium speed, beat peanut butter with the cream cheese, after about a minute then add coconut yogurt. Once combined, reduce to low speed and add sifted powdered sugar, increase back to medium speed and beat until smooth. 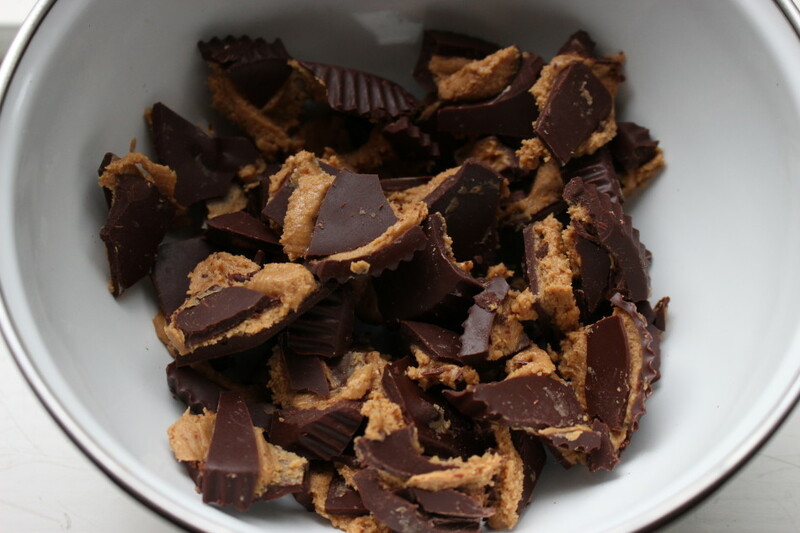 Turn off mixer, add in ½ cup peanuts (reserve the rest for later), and broken pieces of peanut butter cups and combine well. Fold in thawed whipped topping. Pour the filling into the chilled crust and spread evenly. Sprinkle reserved 3 tablespoons of peanuts, dark chocolate chips, and reserved cookie crumbs on top. Chill for at least another 90 minutes before serving. Slice with a sharp knife (to cut through all the peanut butter chunks) and serve chilled. Note: This can be made 4-5 days in advance and freezes well when covered with a 3-ply seal of plastic wrap. If made ahead and frozen for days, thaw for 15 minutes before slicing. This cake is calling my name. 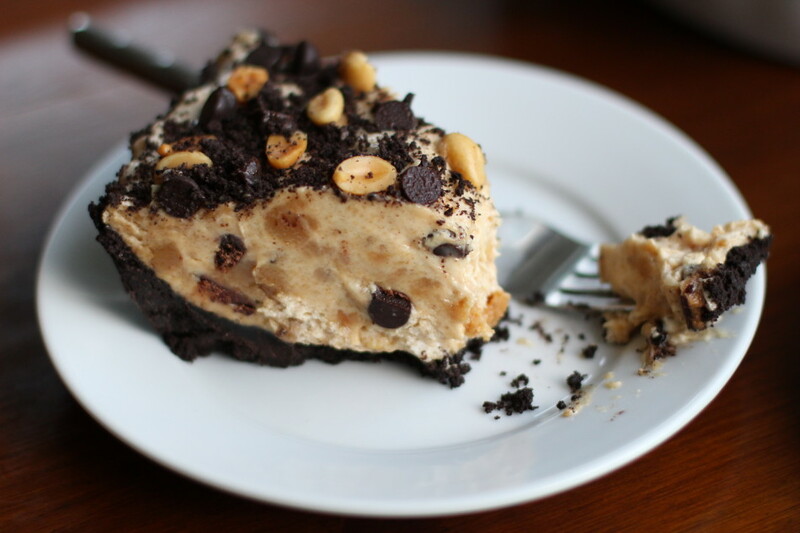 We love anything peanut butter-chocolate this looks divine. Thank you for listing which brands you use, it makes shopping for ingredients easy! Your welcome Kim! Why guess and have it turn out differently, right?! YUM. This just may be a weekend treat to bring a little summer in, thank you Jessica! This looks easy enough for me to handle. I want to use the GF Sandwich Oreo cookies for this, is it the same amount of cookies? And how deep of a pie plate do you use? Cynthia, yes same of cookies. I used a 1 1/2 inch deep pie pie plate. If you want the crust to come up all the way to the rim (I didn't find it necessary) add 6 more cookies. Enjoy! My family would go crazy for this!!! I made this today for dessert for my in-laws. I used the dark brownie cookies, it came out mushy when I mixed it but when I spread it in my pie plate, filled (used the brands you used) and chilled it-perfect! It sliced very well and they were impressed. I was thrilled with the results. Thanks for making me look like "a rock star" tonight! Hi Jessica! I didn't make this but tried this AMAZING pie last night at a Grammy's house party and couldn't resist bugging Maya (she's subscribed and made this) for the recipe as it was too perfect. I'm not gluten-free or dairy-free (one of our friends is) but we were all going PEANUTS over this so I wanted to write to you and let you know that this was the highlight of the evening. I just subscribed and have already bragged about this to everyone here at work today. Cheers! - Cindy. Aww, thank you for sharing and your kind words! Happy you all enjoyed it and thank you for subscribing Cindy! I made this today as a treat for my kids. I used double chocolate cookies, a different cookie than you had suggested with coconut oil for the crust. Everything else as written in the recipe and it came out so silky, so rich, this is some recipe! Thank you for sharing! Yay!! I know, it's dangerous! Sure, it's about making life easier, right ?! This pie looks really yummy. I usually make "whip cream" with canned coconut milk. Can I use that instead of the store-bought whipped topping you suggested? I am trying to keep my sugar down but not sure if the coconut whipped cream would be the same consistency. Thanks! Awesome recipe! I made this with gluten free oreo type cookies and the ingredients you used and Wow this was so rich. My crust came up 3/4 high but held together from being frozen. You do need a very sharp knife for this or it will cut jagged. I just pulled this out of the freezer and it looks so decadent and I cannot wait to serve this soon for my Oscar party -we are ready to dig in! OMG so happy I found your blog through Foodgawker, this is one serious cake. SO rich. I used gluten free "oreo" cookies for the crust and followed your recipe with my fingers crossed (some recipes are only pretty) for an amazing result and it delivered- BIG time. My husband requested this as his birthday cake in May! Jessica, thank you!! It is some seriously rich pie, as it should be :) So happy to hear you all loved it and gave my recipe a try!! Made this today for my Mom's birthday and was over the moon! Wish I made two because it was gone in seconds.